Today sipping my morning coffee I clicked into Twitter and was intrigued by a tweet from @chrisbrogan. Script: "Wearing your baby seems to be in fashion. I mean, in theory it’s a great idea. There’s the front baby carrier, sling, schwing, wrap, pouch. And who knows what else they’ve come up with. Wear your baby on your side, your front, go hands free. Supposedly, it’s a real bonding experience. They say that babies carried close to the body tend to cry less than others. But what about me? Do moms that wear their babies cry more than those who don’t. I sure do! These things put a ton of strain on your back, your neck, your shoulders. Did I mention your back?! I mean, I’ll put up with the pain because it’s a good kind of pain; it’s for my kid." Surfing over to #MotrinMoms (a summary of tweets tagged with #MotrinMoms) I was overwhelmed. At that time there were 65 pages, with 15 tweets per page, or 975 posts. I can only imagine what the team at McNeil Consumer Healthcare, a division of Johnson and Johnson, must be feeling. The majority of tweets were from moms who were Passionately outraged about the video. They felt hey and their babies were being disrespected. So passionate that Mamikaze designed t-shirts, mugs, buttons and bags for sale at CafePress. So passionate that Katja created a video of what she felt was should have been the message. In social media style it was uploaded it to YouTube. Before this post went live there were 2014 views. People are wonde ring .. So .. I've been thinking .. if McNeil Consumer Healthcare were a social media marketing client how would I advise them? First I'd say, especially to Bonnie Jacobs, VP Communications and Kathy Widmer, VP of Marketing - McNeil Consumer Healthcare - take a deep breath and be prepared for some long nights. Second I'd say "listen" to the angst of what should be the community of Motrin Moms. Sadly, you will learn that you have lost some customers. You will learn what went wrong for these moms and how they felt. You will learn from women who were so upset that they took online, tweets and blog posts, offline to main stream media, advertisers and friends. You will also learn from women who generously offered ideas on what McNeil Consumer Healthcare could have done with the campaign that would have added value and increased brand appreciation. But not tuning in while you launch a new tactic borders on gross negligence, in this day and age. Rolling out a new tactic is THE most important time to lend an ear. The lesson here for corporate America? This didn’t have to happen. All you have to do is ask and Moms will help — with your creative, your research, your buzz. Third, I'd say join the conversation sooner than later. That is the challenge. How do you reach out to over a thousand people who have written about you? Do you invite a handful of mommies to corporate headquarters and wine and dine them? How do you determine the "influencers?" No matter who you tap there will be hurt feelings. How do you give back to a community? Maybe you make amens by identifying moms in need. Maybe you do something Big that is Important. Maybe you ask the community's help in identifying what that should be. Not stepping into social media especially when a significant, vocal, powerful segment of your market .. IS stepping into social media. I am the Vice President of Marketing for McNeil Consumer Healthcare. I have responsibility for the Motrin Brand, and am responding to concerns about recent advertising on our website. I am, myself, a mom of 3 daughters. We certainly did not mean to offend moms through our advertising. Instead, we had intended to demonstrate genuine sympathy and appreciation for all that parents do for their babies. We believe deeply that moms know best and we sincerely apologize for disappointing you. Please know that we take your feedback seriously and will take swift action with regard to this ad. We are in process of removing it from our website. It will take longer, unfortunately, for it to be removed from magazine print as it is currently on newstands and in distribution. 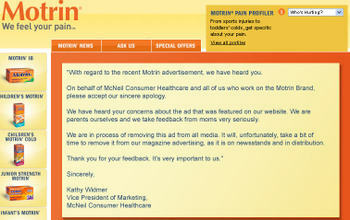 Update: 11-18-08; Kathy Widmer, VP of Marketing apologizes on the home page of Motrin. Part 2 of Motirn: A Case Study in Social Media. Â» Trends 2009 # 2 -Brand Stalker Cometh, this year. from Rajesh @ Blogworks : blogs & social media in India; public relations; brands & marketing! Stories like this make companies frightened of using social media tools. I wonder if there is something to the "take a deep breath" idea - or "this to shall pass". They tried. They tried to be empathetic and they tried to relate. I give them kudos for that. What they didn't take in account is the sensitivity or the quick response rate of mom bloggers/tweeters to give their opinion. Perhaps everyone needed to take that deep breath. Frightened? Are you kidding? They executed a poorly though out ad campaign and were called on it. If anything this shows that companies NEED to be aware of social media and that serving their customers needs to be more of a transparent process. The old business model is dying. Those that adapt will survive. I have done three blog posts about this very topic today (http://tinyurl.com/4excku) -- something *very* unusual for me, but you have succinctly and elegantly summed up the debate by posting comments from both sides as well as some good commentary from some "A-List" tweeters like Chris Brogan. What continues to puzzle me and I have asked others today (including the Goddess) is WHY this campaign? In an era of Hooters commercials, dumb-guy sit coms, other media discussing how moms are overwhelmed, why did this one light a fire? I will also learn from women who generously offered ideas on what McNeil Consumer Healthcare could have done with the campaign that would have added value and increased brand appreciation.